Looking for an easy-to-use Learning Management System (LMS) to get your content out to your students? SkyPrep is here for you. With our eLearning platform, you can build your tests and courses within minutes. Just sign up for free to get started! Our LMS software creates a fun and engaging learning environment for students. Categorizing exams, creating learning paths, and embedding customized videos and audio files are just some of the things you can do with our platform. 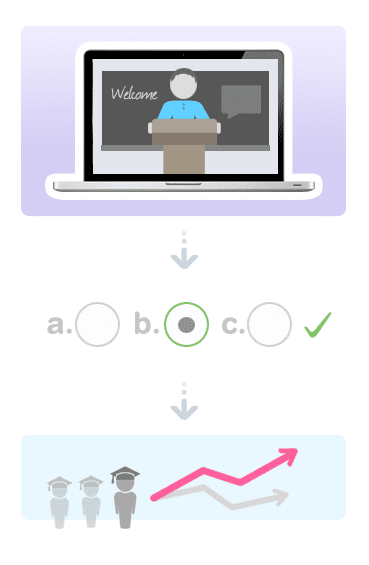 Build tests using our easy test maker, and use them in as many courses as you want. Your students can either attempt practice quizzes or marked tests. You can show your students their mistakes with detailed solutions and explanations. Measure and analyze how your students are performing with our analytical tools and reports. You won’t have to waste countless hours marking exams as our platform does it for you. Instead, use your time improving the learning experience for your students. Let our eLearning software do all the work for you!